I’ve been using my two transmitting loops for a while now, so I now have a better sense of how they perform and of their usability. I don’t use the “unusual” loop much. According to the KI6GD Magnetic Loop Antenna Calculator, it should be about 50% efficient (this figure depends on the material, aluminum, the diameter of the conductor, the circumference, and the frequency, 14MHz). I can tune it, but pushing the gimmick capacitor in and out of the tube is not a convenient tuning method; this is why I don’t use it much. It’s a little difficult to tell how efficient the coax loop is. The calculator program says it’s 32% efficient on 14MHz, but it is not made of solid copper but rather the coax braid and inner conductor. The two N connectors also add resistance, but I don’t know how much. The program estimates the resistance of the loop to be 0.078Ω, so if the coax and the connectors add something in this range (which is very little; if you use the coax and connectors as 50Ω transmission lines, 0.078Ω is almost nothing), the antenna could be a lot less efficient than the 32% that the program calculates. On 7MHz the theoretical efficiency is only 4%, 12% on 10MHz, 66% on 21MHz, and 84% on 28MHz. I use mostly the coax loop because it is easy to tune. Its variable capacitor, which you can see in the picture, is driver by a vernier dial, so it’s fairly easy to tune. I can now do it by ear most of the time: I turn off the automatic gain control (AGC) in the receiver and tune to maximum noise. This often gives acceptable SWR. If not, I reduce power to about 1.25W (5W in AM mode) and tune by watching the SWR meter. When I started using the loop with the FT-857D, I wanted to be able to transmit on 7MHz, to participate in the local weekend net. The tuning capacitor is a 4-section type with a common shaft. I initially soldered the loop to two sections in a split-stator configuration (the loop was connected to two stators and the rotors are connected by the shaft and floating; this puts the two sections in series without a moving contact). The antenna did not tune on 7MHz, so I connected the two remaining sections too. This allowed it to tune from below 7Mhz to about 24Mhz. 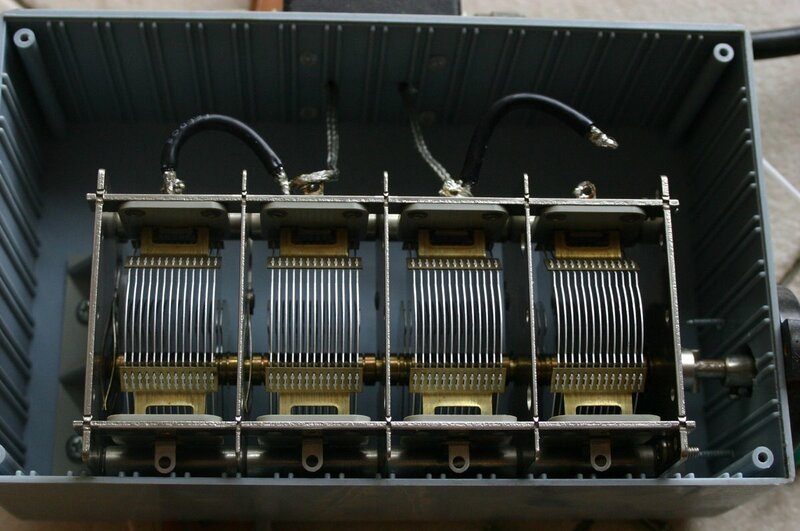 In the picture above you can see one section-to-section jumper in place and one half connected; the jumpers are made of RG58 coax. In this configuration, I was able to participate in the 7MHz net, but my signal was obviously weak (even in the best case that the loop is indeed 4% efficient, I was only emitting 4W peak). Since the higher bands began to open in the last few days and since my signal was very weak on 7MHz, I decided to modify the antenna to target higher bands. I unsoldered the jumbers to leave only 2 sections connected. The loop now tunes from the upper part of the 7MHz band to 30MHz or so. Over about four weeks, I was able to make PSK31 contacts on 14, 18, and 21MHz, JT65A contacts on 14MHz (my serial interface injects noise on the 21Mhz JT65A frequency; I’ll investigate, but so far this prevented me from working there), and SSB contacts on 14Mhz and 21MHz. I did not manage to operate when the 28MHz band was open, but I expect that I can make contacts there too. Working PSK31 and JT65A stations with this antenna on the higher bands is easy. Stations usually hear me and reply. In PSK31 I worked stations from all over Europe; on JT65A also in the Philippines and Sri Lanka. SSB is not so easy. In many cases I can hear the a station very well but it does not hear me. Working with such a small antenna requires patience. But I did manage to work European stations on SSB. I normally get weak signal reports. But when conditions are good, the loop permits clear and pleasant communication; I was able to have a long chat today with a German station 2800km away from me. A big antenna on the other side obviously helps too. The antenna does not arc across the capacitor even with 100W SSB and 50W in digital modes. I was worried about this possibility but it did not happen. Small loops have a narrow bandwidth, but I have not found this to be too annoying. Once I tune it in a given part of the band, say 21Mhz SSB, I can tune the transceiver up and down quite a bit without having to retune. Maybe this is an indication that the antenna is less efficient than the KI6GD Magnetic Loop Antenna Calculator estimates. But it’s convenient. Finally, the experience with the loop so far validates my decision to buy a 100W transceiver. At some point I considered buying the FT-817, which outputs only 5W but is otherwise very similar to the FT-857D. An inefficient antenna and a low-power transceiver would not be a good combination; but with a relatively inefficient antenna and a high-power transceiver you can communicate.